1. Open ImageManager. On the navigation panel on the left side of the screen, click on Agent Settings, then Locations. 2. From the Type dropdown, select intelligentFTP. 3. Type in the Name you wish to use to identify the location. Note: We recommend using the same name as the Location Path. In this example, we used sp-test1.efscloud.net:37037. 4. Enter the following Path: sp-test1.efscloud.net:37037. Note: We use port 37037 for all iFTP connections to our cloud. 5. Select SSH as the Security setting. 7. Change the Mode to Passive. 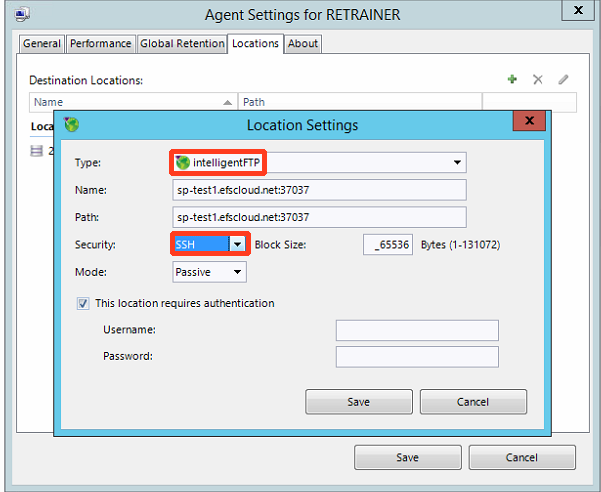 You can select Active or Passive, based on the destination's firewall configuration. An FTP connection made in Active Mode may appear to the destination firewall as if the sender is trying to initiate a connection directly to one of its internal clients. Typically, firewalls will block this type of connection. Setting an FTP connection to Passive mode can avoid this problem. 8. Check the selection This location requires authentication and enter the eFolder customer credentials (user name and password) you set up on the eFolder partner portal. The eFolder cloud is a multi-tenant offering, where each customer’s data is kept separate, based on that customer’s account number. So, you must check the selection This location requires authentication and enter the eFolder customer credentials for EACH customer being set up for replication. To learn more about how to configure a portal account please see Create an Account. 9. Finally, click Save to keep these location settings. 1. Using the main ImageManager window, right click on the volume you wish to replicate. 2. Select Create Job and then Replication. Only the advanced options that you have licensed will be displayed. The Name field auto populates with Replicate backup images of [folder name]. This setting can be changed, if you wish to use a different name. 3. From the dropdown Type field, select intelligentFTP. 4. From the dropdown Location field, select the location entered in the previous step. 5. If you wish to override the global throttling option, you can do so here, using the Override global throttling checkbox. 6. Check the Don’t Replicate Base image files checkbox if you wish to preload the Base Image to eFolder. Note: If you want the Base Image to replicate over iFTP, then leave this check box empty. 7. 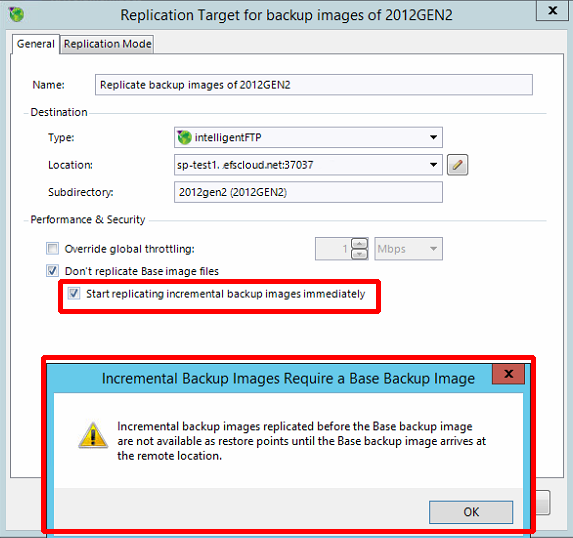 Check the box to Start replicating incremental backup images immediately. 8. 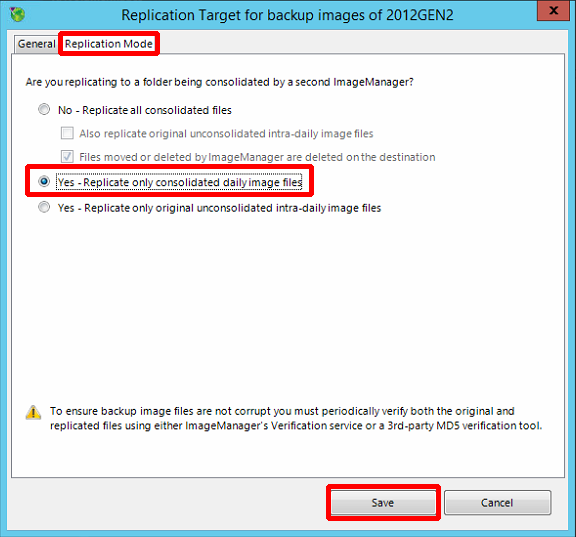 Next, click on the Replication Mode tab and select Yes – Replicate only consolidated daily image files. 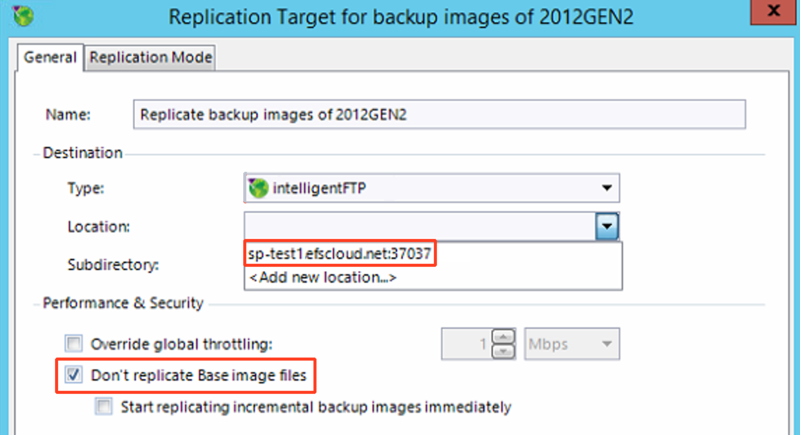 Note: This replication job will be sending the backups to a compute node running ImageManager 7 within the eFolder Cloud. 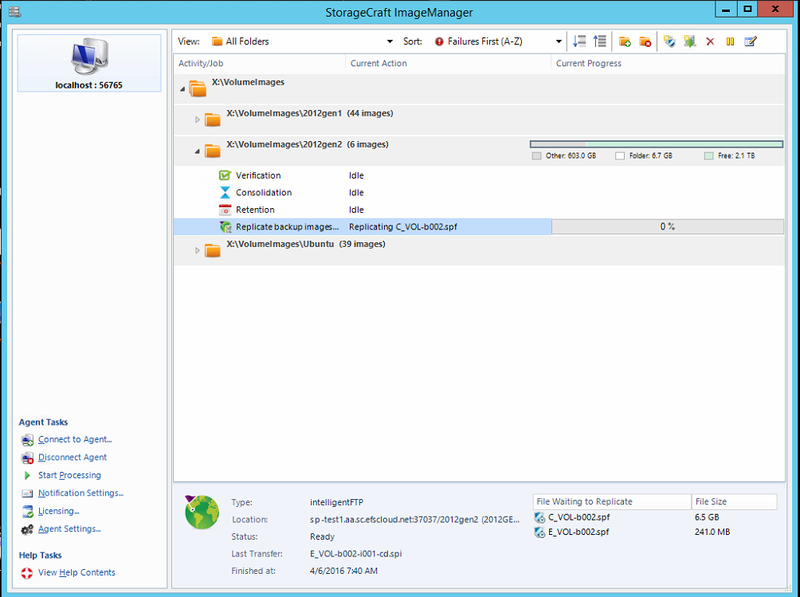 It is only necessary to send the consolidated daily image files, as the remote ImageManager will be managing the backup chain in the cloud. Consolidated weekly, monthly and the consolidated Rolling files will all be created in the cloud. At this point, you can add other replication jobs.